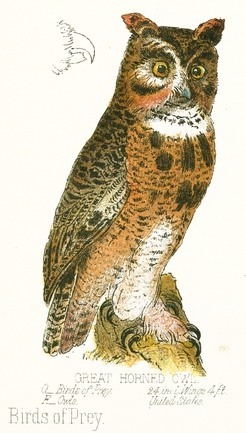 Vintage full-color owl illustration featuring a great horned owl. This copyright free bird images features one of the larger owl species native to the Americas. Download and use this bird image on your next art project. The title of this book Birds of Prey, Prang’s Natural History Series for Children bears the name of the publisher. The author was Norman Allison Calkins and the book was published without identifying an illustrator in 1878. How sad when it included so many wonderful bird drawings.